Approximately 60-70% of the population who has diabetes will eventually get diagnosed with peripheral neuropathy. Pretty high number, right? If you are confused about your diagnosis of diabetic peripheral neuropathy, please read on. If you have been recently diagnosed and are looking for treatment options, please read on. This article will discuss peripheral neuropathy facts, treatments, symptoms, and more. We will also spend some time relaying quite a bit of information on spinal cord stimulation (SCS)—a successful treatment option for those with diabetic peripheral neuropathy. We offer this treatment at each of our locations. What is Peripheral Neuropathy? How About Diabetic Peripheral Neuropathy? Nerve damage caused by chronic high blood sugar—that is peripheral neuropathy in a nutshell. When it is caused by diabetes, it is called diabetic peripheral neuropathy. It is actually the most common complication for those with diabetes. This condition leads to several miserable symptoms affecting the feet, legs, and/or hands, including loss of sensation, numbness, and/or pain. There are numerous studies which have shown that diabetics can lessen their risk of nerve damage by maintaining a normal blood sugar level. Muscle weakness— If your blood sugar levels remain consistently high, the nerves that tell muscles how to move may get damaged. This is when some patients experience muscle weakness when trying to walk or stand up from a sitting position. Other patients may experience difficulty carrying or grabbing things with the hands. Be sure to discuss muscle weakness with your doctor. Balance problems— balance problems can occur because of muscle damage. If you find yourself more clumsy, uncoordinated, or unbalanced than usual, be sure to let your doctor know. Touch sensitivity— Some patients with peripheral neuropathy experience a heightened touch sensitivity. This is similar to a numbness or a tingling sensation in the hands, toes, feet, or legs. If you experience touch sensitivity, tell your doctor. When patients are diagnosed with Type 2 Diabetes, he or she often has multiple health problems, as well. This complicates the diagnosis of peripheral neuropathy, especially during the early-onset phase when patients first start experiencing symptoms. Doctors may sometimes confuse neuropathy symptoms with other health problems. Who Gets Peripheral Neuropathy? What Causes It? Peripheral neuropathy is a commonly widespread condition affecting everyday folk, as well as those who served in the Armed Forces. Those who have chronic high blood sugar levels are more likely to develop neuropathy when compared to healthier individuals. The high blood sugar levels cause damaged nerves in the body’s extremities (hands, feet, legs, toes), as well as other parts of the body. When the nerves become damaged, messages cannot be effectively sent to the brain and other parts of the body. Because of this, patients may not feel cold, heat, pain, et cetera in the extremities. Some patients are not even aware of a cut on his or her foot since they cannot feel it. That is why it is very important to always check your extremities for changes, especially your feet. Peripheral neuropathy consequences and symptoms can become life threatening if not taken care of properly. For instance, if an infection cannot heal properly due to poor blood flow, an ulcer could develop, which can lead to amputation or even death. As mentioned in the previous section, you should always take note of your symptoms and discuss them with the doctor. Unfortunately, some patients ignore their symptoms, just assuming that they’re signs of old age, when in reality, they could be symptoms of diabetic peripheral neuropathy. Approximately 19.5 million gallons of a chemical agent called Agent Orange was used on 4.5 million acres in Vietnam during the Vietnam War from 1961 to 1972 (known in the U.S. as Operation Ranch Hand). The chemical called dioxin was contained in the Agent Orange mixture. Out of the 3 million American soldiers who served during the Vietnam War, more than 1.5 million soldiers were directly exposed to Agent Orange (that number does not include the millions of Vietnamese citizens who were exposed and negatively impacted). Thousands, if not millions, of United States Armed Forces soldiers were exposed to Agent Orange. Today’s Vietnam War veterans unfortunately experience side effects, such as birth defects, cancer, peripheral neuropathy, and many more serious conditions. Schedule consistent appointments with your podiatrist and/or your foot and ankle physician. Schedule consistent appointments with your primary care doctor and/or endocrinologist. Doing so can help to prevent/treat complications arising from diabetes. Inspect both of your feet every day. Report any changes (redness, cuts, bruises, etc) to the doctor. When caught early, you could potentially prevent the problem(s) from getting worse. Wear good-fitting, comfortable shoes. Do not wear shoes that could potentially cause blisters or sores. Keep the blood sugar levels under control. How is Peripheral Neuropathy Treated? Tried Creams, Lotions, and Medications to Treat Neuropathy, but Nothing Works? What are My Options Now? There are a few creams and lotions out on the market to help ease neuropathy pain, and to help slow the condition’s progression, as well as to limit the damage. Homeopathic remedies are also available for those who are looking for a natural way to stop the pain. On the other spectrum, several medications are available from your doctor, which can also help to alleviate symptoms. Speaking with your doctor about the symptoms you’re experiencing is the first step to getting the relief you need. It is important that you never ignore your symptoms; in due time, the symptoms can become worse. Keep in mind that some creams, lotions, and medications simply do not work as effectively as you’d like them to. If you’ve tried countless methods to stop neuropathy pain, but nothing has worked so far (or worked very little), call Prospira PainCare. One treatment, called spinal cord stimulation (SCS), can help diabetic peripheral neuropathy. Spinal Cord Stimulation: What is it? Spinal cord stimulation is a cutting-edge, successful alternative to relieve chronic neuropathic pain (including diabetic neuropathy), complex regional pain syndrome (CRPS), and post-laminectomy syndrome (residual pain experienced after back surgery). Pain relief is made possible through the use of an implanted device, which transmits mild electrical impulses to the spinal cord. This mild stimulation interrupts the feeling of pain; instead of feeling pain, a more pleasing sensation (called paresthesia) is experienced (often described as a pleasant tingling sensation). In a nutshell, SCS allows patients to control and relieve the pain so it does not disrupt your daily life. With the use of spinal cord stimulation, many patients can significantly reduce or even eliminate the use of pain medications. This is very important for those who do not want to rely on prescription painkillers on a daily basis, possibly risking painkiller addiction. Another important fact to point out is that SCS is a reversible therapy, even though it is referred to as “permanent.” This means that if you decide you no longer want to use SCS treatment, the implanted parts can be removed easily. How Does Spinal Cord Stimulation Work to Relieve Chronic & Acute Neuropathy? If our physicians determine that SCS may be right for you, a trial period will take place as the first step. The purpose of the trial period is to use a temporary stimulator to further determine if you will experience satisfactory pain relief. The trial period is a good time to find out if you are comfortable with the sensations that are produced from spinal cord stimulation. It is a fairly quick process to get started with the trial. On an outpatient basis in the office, our physician will use a local anesthetic to numb the area before we place one or two leads along the spinal cord. The soft, thin wires attached to the electrical leads are gently placed in the best location, and then connected to a portable, external generator. Once connected properly, the system will produce mild electrical pulses that will reduce your pain. The length of time required for a trial period varies from patient to patient. Our physician will make this determination. It can last anywhere from a few days up to one week. If your trial period is successful, you and the physician can determine if you can benefit from spinal cord stimulation. If you can benefit from SCS, another appointment will be scheduled to place the “permanent” SCS system. It is very important to note that you, as the patient, is always in control of the SCS system at home, at work, and everywhere else. By using a magnetic remote control, you have the capability to turn the current on and off, as well as to adjust the intensity. And since the SCS system is portable, you can go about living your life as you normally would. 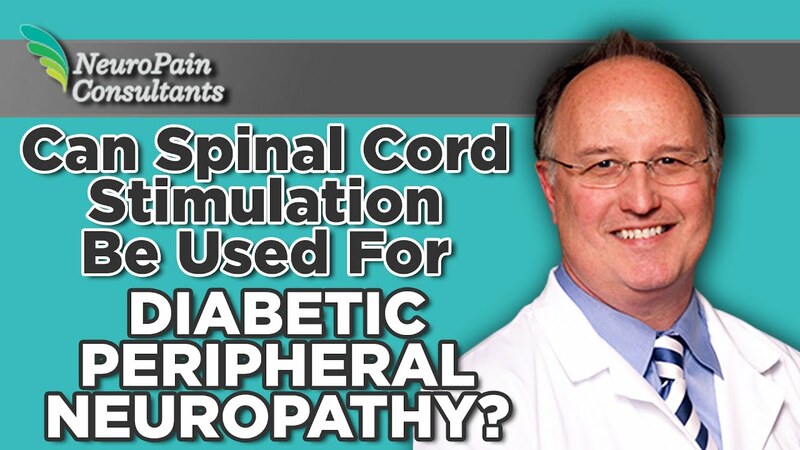 These capabilities allow you to make necessary adjustments to relieve diabetic neuropathy pain. The procedure performed for the first phase, referred to as the trial phase, typically takes approximately 30-45 minutes. This appointment is followed by a short period of recovery so we can observe the patient. The second phase, when we implant the long-term device, typically takes approximately 2 hours. A surgeon will implant the device in an outpatient surgical setting. Is Spinal Cord Stimulation Effective? Does SCS Actually Work to Relieve Diabetic Peripheral Neuropathy? With spinal cord stimulation treatment, you can expect a decrease in the severity of chronic pain so it is more manageable. The degree of pain relief will vary from patient to patient, however. Current studies have shown that 85-90% of those who received SCS treatment reported a 50-70% reduction in overall pain. This has allowed them to enjoy their time with family and friends at a significantly higher level of satisfaction. Also based on current and past studies, we know that pain reduction can positively impact your mental outlook, improve quality of life, and reduce stress. Several more clinical studies are currently underway to further determine the effectiveness of spinal cord stimulation. Diagnosed With Diabetic Neuropathy? What To Do Now? Have you been recently diagnosed with diabetic peripheral neuropathy? Are you wondering which types of treatments are available to help with the pain? Or are you someone who was diagnosed years ago and has tried creams and medications without success? Whichever situation you find yourself in when it comes to diabetic neuropathy pain, call us if you want relief. One of our knowledgeable physicians will evaluate your symptoms and health history to determine if spinal cord stimulation is right for you. All you need to do at this point, if you haven’t already, is call one of our offices to schedule a consultation appointment. That is the first step to learning more about your options. We look forward to meeting you and to helping you experience a lifestyle with less pain.